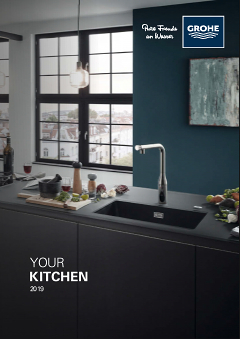 The Minta kitchen tap is a blend of cool modern design and cutting edge technology. Crafted with a high C-shaped spout, this mixer makes washing or filling even tall pots a simple pleasure. It comes with an adjustable swivel range that can be set to 0°, 150° or 360°, allowing you to lock the spout in position or switch flexibly between two basins. With a lever that moves super smoothly thanks to the integrated GROHE SilkMove technology, the control of water volume and temperature is effortless and precise. Finished in GROHE SuperSteel, this tap has a matt stainless steel look that is extremely scratch resistant and durable. To make this attractive package perfect, our easy installation system ensures a hassle-free installation. With just a few simple steps, you'll have it fitted in no time.